A HUMAN PERSPECTIVE In Egypt, a seasonal dry wind is called khamsin (“fifty”) for the number of days the season occurs. During khamsin, wind-driven sandstorms kill and injure people, close businesses and airports, and strip topsoil and seed from the ground. Sandstorms are not limited to the desert areas of Africa and Southwest Asia. For instance, a five-hour storm recently blasted Jingchang, China, causing millions of dollars of damage and killing about 300 people. Sandstorms are among the external forces that change the shape of the earth and affect the lives of the people in their paths. In the last section, you learned about forces within the earth that changed the land. External forces, such as weathering and erosion, also alter landscapes and in some instances create the soil that is needed for plant life. Weathering refers to physical and chemical processes that change the characteristics of rock on or near the earth’s surface. Weathering occurs slowly over many years and even centuries. Weathering processes create smaller and smaller pieces of rock called sediment. Sediment is mostly identifiable as either mud, sand, or silt, which is very fine particles of rock. Processes that break rock into smaller pieces are referred to as mechanical weathering. Mechanical weathering does not change the composition of the rock—only its size. For example, when ice crystals build up in the crack of a rock, they can actually create enough pressure to fracture the rock into smaller pieces. All sorts of agents can break apart rocks. Frost and even plant roots dig into crevices in the rock, splitting it. Human activities, like road construction or drilling and blasting in mining, are also mechanical weathering forces. Eventually, the smaller broken material will be combined with organic material to become soil. Chemical weathering occurs when rock is changed into a new substance as a result of interaction between elements in the air or water and the minerals in the rock. Decomposition, or breakup, can happen in several ways. Some minerals react to oxygen in the air and begin to crumble. That is what happens when iron rusts, for example. Other minerals break down when combined with water or carbon dioxide, which form weak acids within the rock. When sulfur and nitrogen oxides mix with water, acid rain is formed. The increase of acid rain in the 20th century is believed to be speeding up some decomposition. The location and the climate in which the rocks are located have a great deal to do with how rocks decompose. Climates that are warm and moist will produce more chemical weathering than do cool dry areas. Rocks in cold dry and hot dry areas generally experience more mechanical weathering than chemical weathering. 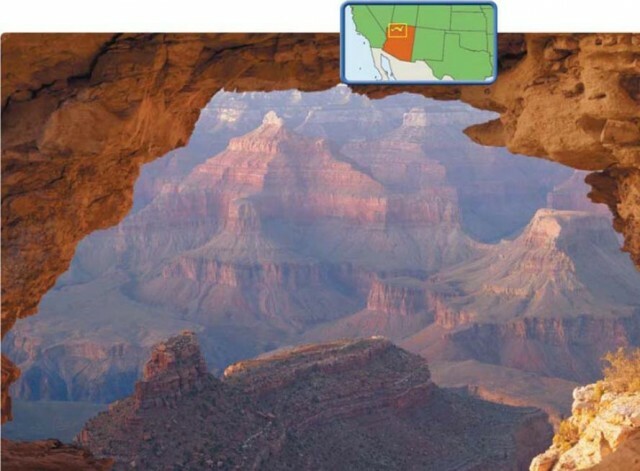 Erosion occurs when weathered material is moved by the action of wind, water, ice, or gravity. For erosion to occur, a transporting agent, such as water, must be present. Glaciers, waves, stream flow, or blowing winds cause erosion by grinding rock into smaller pieces. Material moved from one location to another results in the lowering of some locations and increased elevation in others. For example, water might carry topsoil from a hill into a river and gradually cause the river to become more narrow. Erosion in its many forms reshapes landforms and coastal regions, as well as riverbeds and riverbanks. One form of water erosion occurs as water flows in a stream or river. The motion picks up loose material and moves it downstream. The greater the force of water, the greater the ability of the water to transport tiny rock particles, or sediment. Another form of erosion is abrasion, the grinding away of rock by transported particles. The heavier the load of sediment, the greater the abrasion on the banks and riverbed. A third eroding action of water occurs when the water dissolves chemical elements in the rock. The composition of the rock changes as a result. Most streams erode both vertically and horizontally—that is, the valley cut by a stream gets deeper and wider, forming a V-shaped valley. As the water slows, it drops the sediment it is carrying. When a river enters the ocean, the sediment is deposited in a fan-like landform called a delta. Wave action along coastlines also changes the land. Waves can reduce or increase beaches. Sediment deposited by wave action may build up sandbars or islands. Wave action is so powerful that in some locations, it erodes about three feet of beach per year. For some unfortunate people, a beach house with an ocean view may end up in the ocean as a result of wave action erosion. In many ways, wind erosion is similar to water erosion because the wind transports and deposits sediment in other locations. Wind speeds must reach 11 miles per hour before fine sediment can be moved. The greater the speed of the wind, the larger the particles moved. Dust storms are capable of carrying as much as 6,000 tons of sediment per cubic mile of air. As the wind slows, the sediment is dropped. Depending on the type of windborne sediment, new landforms—such as sand dunes miles from seashores and rocks sculpted into fantastic forms—may be produced. Deposits of loess, windblown silt and clay sediment that produce very fertile soil, are found across the world. In northern China, for example, the deposits are several hundred feet deep. Extensive areas of loess are found in the Mississippi Valley in the United States and in the grasslands of Argentina. A glacier is a large, long-lasting mass of ice that moves because of gravity. Glaciers form in mountainous areas and in regions that are routinely covered with heavy snowfall and ice. 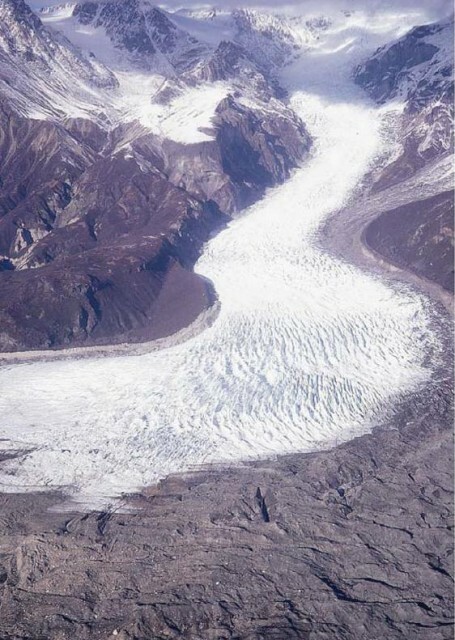 In mountain regions, glaciers move downslope as a result of gravity. Glaciers such as ice caps and ice sheets move from the highest point on land toward the lowest point. Glaciation is the changing of landforms by slowly moving glaciers. As a glacier moves, several types of erosion occur. Rocks caught underneath the glacier are ground into finer and finer particles. Some particles are so small that they are called rock flour, which is one component of soil. Massive glaciers also cut U-shaped valleys into the land. On top of or within the ice are other rocks carried by the glacier. When the glacier melts, these rocks are left behind. Rocks left behind by a glacier may form a ridge or a hill called a moraine. Moraines can be found on the sides, down the center, or at the leading edge of a glacier. Inside or under the glacier may be tunnels formed by running water. These tunnels fill up with sediment dropped by the water. When the ice melts, it leaves a long snakelike ridge called an esker. Sometimes blocks of ice are trapped in the sediment. They melt slowly and leave behind a dent or a depression in the ground. These depressions are called kettles. The kettles may be filled with water forming a small lake. Weathering and erosion are a part of the process of forming soil. Soil is the loose mixture of weathered rock, organic matter, air, and water that supports plant growth. Organic matter in the soil helps to support the growth of plants by providing needed plant food. Water and air share tiny pore-like spaces in the soil. When it rains, the pores are filled with water. As the water evaporates, drains away, or is used by the plants, the pores are filled with air. The texture of the soil, the amount of organic material called humus, and the amount of air and water in the soil all contribute to the soil’s fertility—its ability to nurture plants. Parent material The chemical composition of the original rock, or parent rock, before it decomposes affects its fertility. Relief Steeper slopes, such as mountainsides, are eroded easily and do not produce soil quickly. Organisms Organisms include plants, small animals like worms, ants, and bacteria that decompose material. They help to loosen soil and supply nutrients for plants. Climate Hot climates produce a soil different from that produced by cold climates. Wet climates and dry climates produce soils that are different from each other as well. Time The amount of time to produce soil varies, but a very rough average is about 2.5 cubic centimeters per century. The variety of soils—and the climates in which they are found—determine the types of vegetation that can grow in a location. Agricultural activities, such as farming, ranching, and herding, depend on this complex relationship.